Burbank may be the media capitol of LA but it is mostly a taco wasteland. Aside from the excellent Fiesta Taco on Hollywood Wy it’s slim pickens in this east valley city. It seems the farther from the major studios you get the better your chances are of finding an authentic taco. There’s a couple taqueria’s in east burbank I’ve heard good things about. El Tapatio is one of them. El Tapatio at Alameda and San Fernanado serves up authentic tacos at $1 a pop. The usual suspect of meats topped with a spicy salsa roja and a free side of chips and salsa. Three tacos and a tamarindo sets you back 4 bucks and change which sure beats the corporate offerings of baja fresh and la salsa. I ordered carnitas, asada and al pastor and enjoyed my tacos in the laid back patio area. The free chips and salsa were a nice touch. The carnitas and al pastor shined with the salsa roja . The carnitas shredded and soft, the al pastor a blend of seasonings and juicy goodness. The asada was disapointing however..the beef was bland and unseasoned and a bit fatty. I only got through the asada taco because I drenched it in the salsa. The salsa isn’t crazy spicy but the tamarindo came in handy after I chomped down a couple jalapenos. If you’re in burbank this is a place to check out. Quite a large menu with everything from tacos, burritos, and tortas to chile verde, enchiladas, and mariscos. All quite affordable as well. 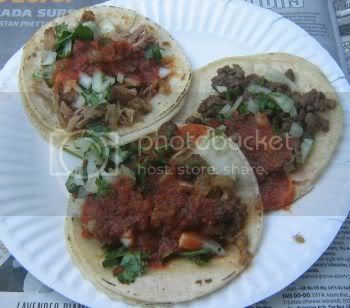 Re: Century City tacos - you were right, there's a truck at Overland/Pico from 11:30am-2pm weekdays. 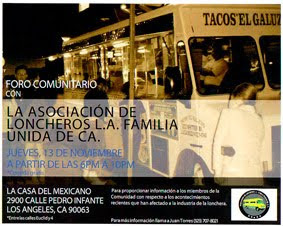 It's Cemitas Poblanas, the same truck posted on Venice just east of Centinela most nights. Tis tasty. There's also a little mex market on Pico 2-3 blocks east of Overland that has a grill, but I haven't tried it. i've been meaning to try this place for ages, it's really close to work. looks pretty decent for the location as you mentioned. Yeah...looks like they picked up the NY Times article from July. re: spinachshark comment, cemitas poblanas is a dish, the truck's name is something else, something I can't remember. I know which truck you're talking about though. 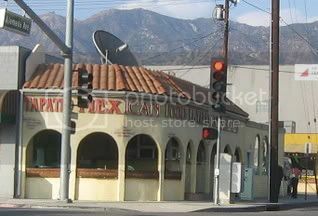 One other comment: isn't tacos la fonda in Burbank? I just stumbled upon your blog for the first time --- nice stuff. Try the El Tapatio #2 on Glendale Blvd in Glendale, near Los Feliz Ave. Try the carnitas tacos in particular. $1.07 @. This place is great for carnitas tacos. I agree with the above poster... Go to el tapatio #2 in glendale. Its better. Ohh this isnt taco related, but try their french fries as a side dish. Thats the greatest place to go to at 2 in the morning. I am agree with the post..
yes you can try french fries..
El Tapatio at Alameda and San Fernanado serves up authentic tacos at $1 a pop. The usual suspect of meats topped with a spicy salsa refreshapoteket roja and a free side of chips and salsa. 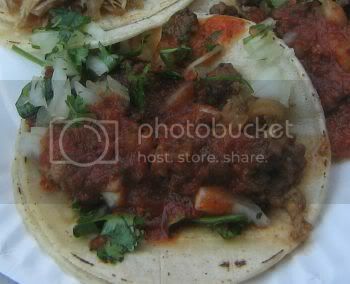 The Taco images look yummy.. its like shawarma, it is an Arabic dish.